February | 2011 | What about this? Outside there’s nothing but rain. But, metaphorically speaking, rain falls inside too – it falls into each of our lives, sometimes in “drizzles” and sometimes in “downpours.” How we weather our storms depends on our outlook. We can choose to simply drown or we can let the waters cleanse our perspective and refresh our purpose. My friend Laura, whose inspirational story I wrote about in Laura’s Gift of Hope, just received the most wonderful and miraculous news – she is in remission! Thanks to all who sent prayers and positive energy her way! But let’s not forget about the others who continue their fight against cancer. For as little as $25.00 you can spread cheer and give hope by donating a Gift of Hope (a bouquet of daffodils) or a Bear of Hope (a Boyds Bear stuffed animal for pediatric cancer patients), both of which are delivered anonymously to someone undergoing cancer treatment during the American Cancer Society’s Daffodil Days, the week of March 22nd. Mahatma Gandhi once stated, “Be the difference you want to see in the world.” The last day to donate online is Monday, February 28th. To be the difference to someone, click here to donate. #3 – Oatmeal at McDonald’s? #4 – Baking Soda Is Not Just for Baking! 2. After you have used the baking soda in the refrigerator, don’t throw it away! Put it in the sink drain or garbage disposal. Add a cup of vinegar and let it stand overnight. Run hot water through it in the morning; it will help keep drains clean and smelling fresh. The purpose of life is not to be happy – but to matter, to be productive, to be useful, to have it make some difference that you have lived at all. Everybody can be great. Because anybody can serve. You don’t have to have a college degree to serve. You don’t have to make your subject and your verb agree to serve. You don’t have to know the second theory of thermodynamics in physics to serve. You only need a heart full of grace. A soul generated by love. The Swarovski crystal: Pink represents the color of breast cancer awareness. The oval ring: Faith is constant and frames our hope. The heart: Love makes us whole. Make a difference to someone this weekend! Everything tastes better with butter. Who can deny this fact? Imagine popcorn, potatoes, bread, corn on the cob, lobster and even Paula Deen without butter. Without their better parts, oops, I mean butter pats, they would definitely be less popular. If you love all things butter, like I do, and if you want to treat your taste buds to something indescribable, try this super easy pasta dish that was mentioned in my Cracked Crab with Meyer Lemon Vinaigrette post. What could be better than butter? How about truffle butter! It’s the special ingredient in this rich and creamy pasta dish that is easy enough to throw together on a busy night, yet is incredibly delicious to serve to company. 1. Add 1 tablespoon salt to a large pot of water and bring to a boil. 2. Meanwhile, in a large (12-inch) saute pan, heat the cream over medium heat until it comes to a simmer. Add the truffle butter, 1 teaspoon salt, and 1/2 teaspoon pepper, lower the heat to very low, and swirl the butter until it melts. Keep warm over very low heat. 3. Add the pasta to the boiling water and cook for 3 minutes, exactly. (If you’re not using Cipriani pasta, follow the directions on the package.) When the pasta is cooked, reserve 1/2 cup of the cooking water, then drain the pasta. Add the drained pasta to the saute pan and toss it with the truffle-cream mixture. As the pasta absorbs the sauce, add as much of the reserved cooking water, as necessary, to keep the pasta very creamy. 4. Serve the pasta in shallow bowls and garnish each serving with a generous sprinkling of chives and shaved Parmesan. Sprinkle with salt and pepper and serve at once. 1. 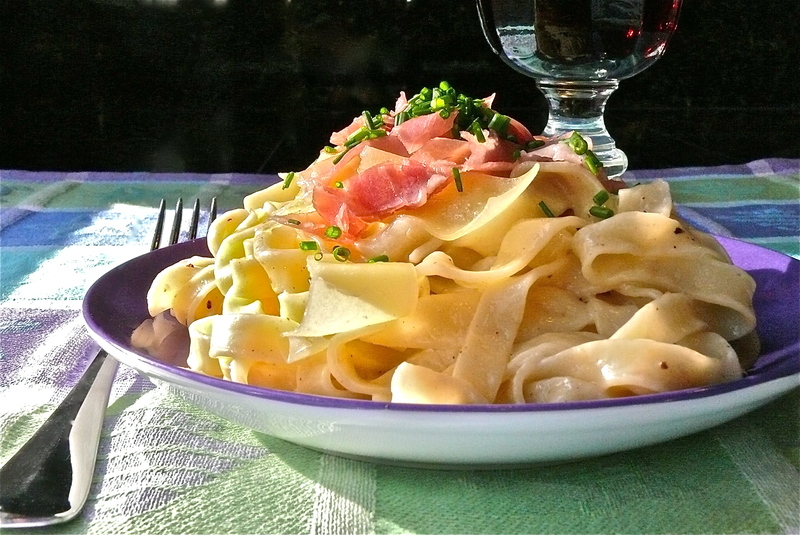 Because I could not find Cipriani tagliarelle and could only find black pepper and garlic tagliarelle, I substituted fettucine. The recipe calls for an 8.82-ounce package of dried pasta, but I purchased a 12-ounce package of fresh fettucine and cooked all of it. 2. I purchased a 3-ounce container of white truffle butter for $9.99 at Whole Foods. 3. The recipe calls for 1 tablespoon of salt to be added to the pot of water, which seemed excessive to me, but I followed the recipe. However, in step 2, I only added 1/2 teaspoon of salt instead of the 1 teaspoon called for and in step 4, I did not add any additional salt at the end, only a little bit of freshly ground black pepper. 4. Because I had it on hand, I added a few small slices of prosciutto for garnish on top. 5. This dish is best served immediately after cooking – it isn’t at its best after sitting around for a while or after reheating. 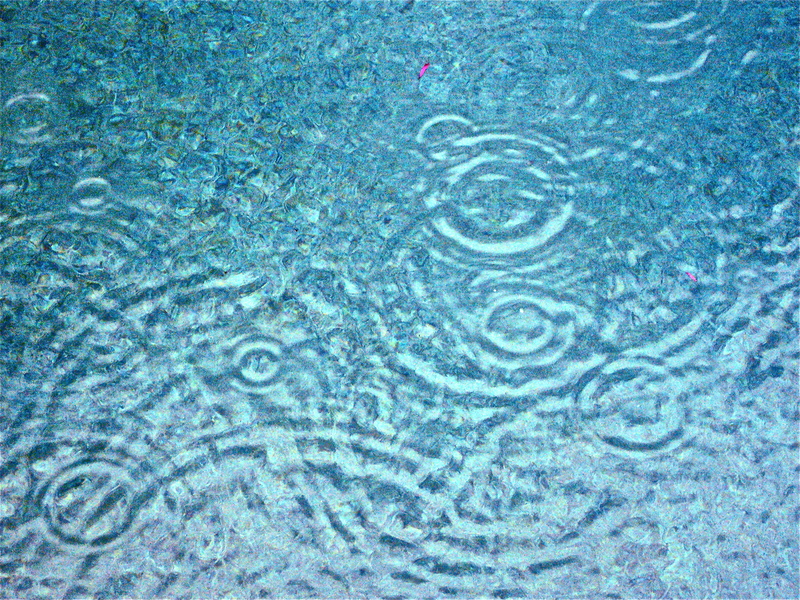 Like a million, twinkling, little lights, raindrops decorate the thin bare branches of ornamental trees and raindrops fall creating overlapping, concentric circles in the already rippled water of the pool. Gusting winds turn bird feeders into revolving circus rides for hungry little birds trying to feed. And as the feeders swirl around and around and up and down, the birds hold on for dear life as they peck away at the seed. Even during a storm, my yard is a source of wonder. I have rain on my brain these days and with thoughts of rain comes thoughts of umbrellas. I never considered umbrellas as an art medium, but after seeing these photos of umbrella art installations, I’ve changed my mind! #2 – How Much Rain is A Lot of Rain? The average city in the United States might receive 25 to 45 inches of rain in a year. New York receives about 43 inches, and Dallas about 32 inches. In Cherrapunji, India, it rained so hard in 1861 that the rainfall totaled more than 1,042 inches, that’s about 87 feet! Lloro, Colombia, in South America receives the highest average annual precipitation on earth, which makes it the wettest place in the world. An estimated 523.6 inches (1,330 cm) of rain falls every year, according to the U.S. National Oceanographic and Atmospheric Administration. Other than using it to cover your head from the pouring rain, there are many different ways to reuse newspapers. Here’s a cute and clever idea – make gift bags out of them! 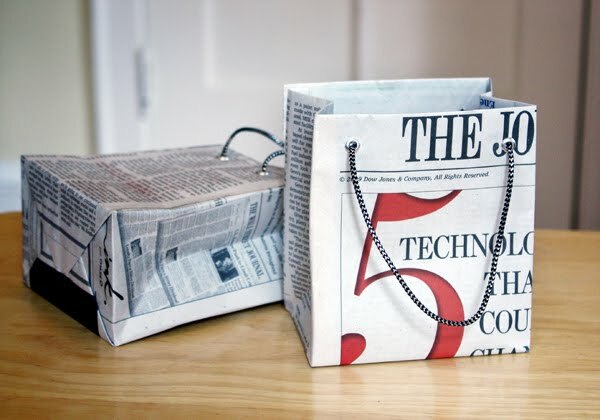 The blog How About Orange has a tutorial on how to make gift bags from newspapers. Now when I read the morning paper, I’ll be looking for colorful ads to use for the gift bags I’m going to make! You’ll be impressed by these amazing and creative photos taken by Steve Wall, an amateur photographer. With his macro lens he captures the reflective beauty of water droplets. After seeing his work you’ll appreciate both the work of nature and the work of the artist. Whatever the weather, enjoy your weekend! Can numbers tell a story of courage and inspiration? Consider the staggering numbers in this story and the incredible story in its numbers. The house is peacefully quiet and broad bands of sunlight stream into the room through large windows as my friend Laura eases herself into a comfortable recliner that is her safe haven for most of the day. An eight-inch scar races down her abdomen and painfully reminds her of her sixth cancer-related surgery. With her aging dog lying at her feet, she shows me colored photos of the cancerous “stalactites” that peppered her peritoneum, the membrane that forms the lining of the abdominal cavity. I am in awe of her while she calmly reminds me about the details of her eleven-year fight against three primary forms of cancer. While most of us would be daunted by the prospect of a single round of chemotherapy, Laura is about to begin her fourth – she has Stage 4 peritoneal cancer. Saying that Laura is one of the most courageous and inspirational people I know is clearly an understatement and is one that I wish I didn’t have to make. As bright as the sunlight that streams into the room, so is Laura’s hope. The mere fact that Laura is involved in fundraising for three major cancer organizations while in the throes of her own battle is proof. As an eight-year active volunteer for her county’s American Cancer Society’s Daffodil Days Campaign, Laura has an ambitious goal. She hopes that during Daffodil Days as many cancer patients as possible will be able to receive a Gift of Hope. 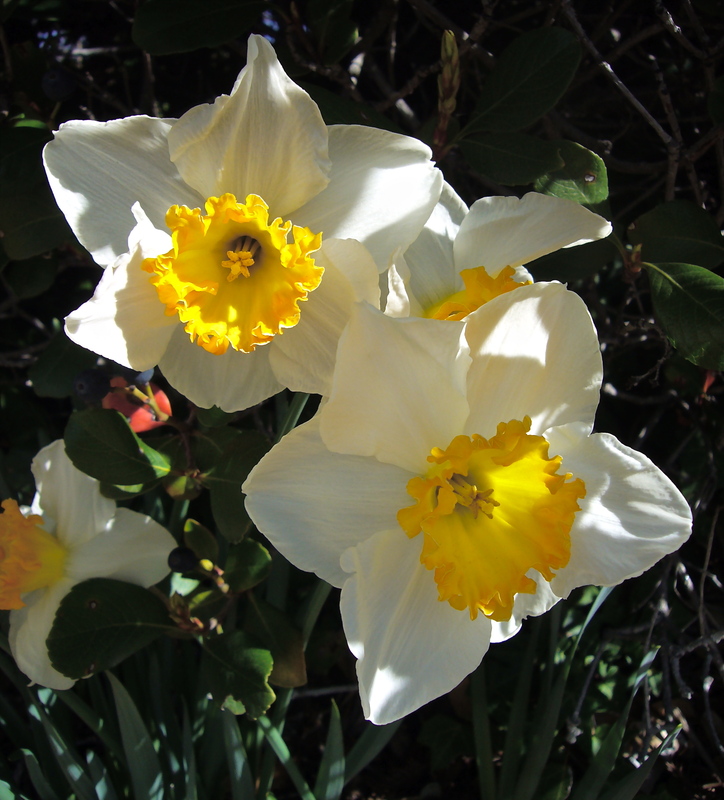 A Gift of Hope is a bouquet of daffodils that is donated anonymously and is delivered to someone undergoing cancer treatment during Daffodil Days. She vividly recalls the day, more than a decade ago and during one of her chemotherapy sessions, when a stranger walked into the room and handed her a bouquet of cheerful yellow daffodils. That person was a cancer survivor and an ACS volunteer. Laura’s eyes light up as she explains to me how much receiving that bouquet meant to her that day. Her emotional words and her dedication to this campaign make it clear just how very much that bouquet means to her even now. Last September Laura and nine of her friends participated in the Avon Walk for Breast Cancer. Walking thirty-nine miles over a two-day period can be a grueling task, but for Laura, who had just finished her third round of chemotherapy, and her friends, each step gave them another measure of hope. With Laura by their side as an inspirational guide, they all completed their 39-mile journey and raised almost $40,000 to go towards breast cancer screening, support, treatment, and research. Laura is a gift to all who know her and is a gift of hope for all cancer patients that she tirelessly raises money for in an effort to find cures. If her story inspires you or if you want to bring hope to people facing cancer and help save lives through cancer research, please consider donating a Gift of Hope during the American Cancer Society’s Daffodil Days Campaign. You can access Laura’s Daffodil Days donation page by clicking here. Online orders can be made through February 28th. Laura and I thank you. Sometimes it pays to save old magazines. From an old Sunset Magazine, dated February 1997, comes this quick to make Red Pepper-Tomato Soup that’s perfect for a cold and wet Valentine’s Day. Many aspects of this recipe make it appealing. First, it is low in calories, fat, and carbohydrates. The amount of cholesterol is negligible, especially if you use vegetable stock and do not add any cream garnish. It’s a smooth and thick soup, much like a cream-based soup, but happily without the cream. Second, this recipe requires few ingredients and most of the ingredients are pantry staples. Third, both the red peppers and tomatoes are good sources of lycopene. According to Livestrong.com, Lycopene is an antioxidant molecule found in red-colored fruits and vegetables such as tomatoes. A number of studies have shown that diets rich in tomato products can lower the incidence of several cancers as well as heart disease, possibly due to their high lycopene content. The chemical structure of lycopene gives it a number of antioxidant properties that may in theory help prevent cellular damage and fight off some of the effects of aging and chronic disease. 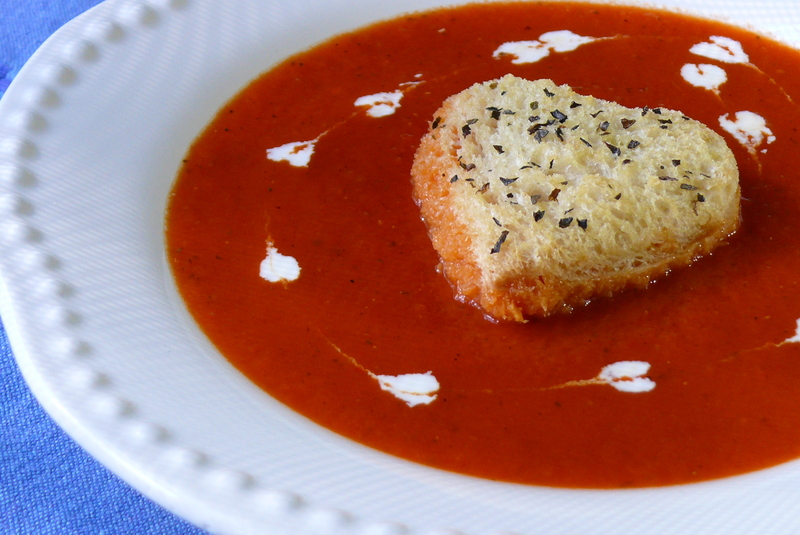 Show your special someone how much you care by serving them this attractive, heart-healthy, red soup. It’s up to you whether or not you want to add the cream garnish, but you’ll really want the heart-shaped croutons to soak up all that hearty goodness! until golden and crisp, about 15 minutes for a 3-inch-wide heart. 2. Meanwhile, in a 2 or 3-quart pan, cook shallots, stirring often, in remaining 1 teaspoon oil over medium-high heat until shallots are translucent, about 3 minutes. Add broth, red peppers, tomatoes and their juice, and remaining 1/2 teaspoon basil. Bring to a boil over high heat; cover and simmer over low heat 5 to 10 minutes. 3. With slotted spoon, ladle peppers, tomatoes, and shallots into a blender or food processor; whirl until smooth. Return puree to pan; stir into liquid. Add salt, pepper, and sugar to taste. Ladle soup into bowls. Spoon dollops of sour cream decoratively over soup; swirl with the tip of a knife through sour cream. Immediately before serving, set heart-shaped croutons on top. 1. I used a 12-ounce jar of roasted red peppers. After rinsing and draining, the amount of red peppers came to just a tad over one cup. 2. Although the recipe called for a 16-ounce can of tomatoes, I only had a 28-ounce can available. I threw the whole amount into the pot figuring it couldn’t hurt – plus what was I going to do with the few remaining canned tomatoes? 3. I started with 1/2 teaspoon of salt and found that was enough for my low-sodium taste buds. I added about 1/2 teaspoon to 1 teaspoon of sugar – this amount will depend on the sweetness of the tomatoes you are using. 4. The dollops of sour cream sank to the bottom of the bowl, so I used heavy cream instead and dragged a toothpick through them to create the “almost” heart-shaped swirls. 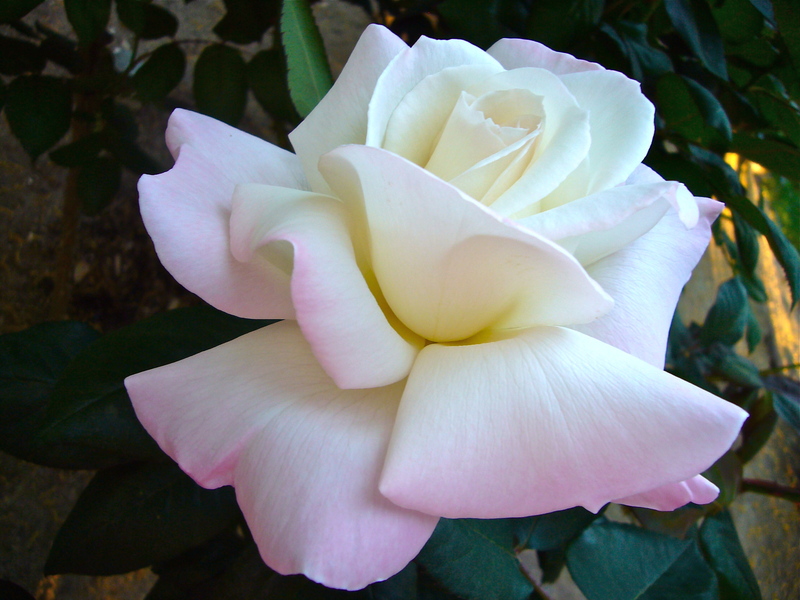 The sun bathes my skin in warmth as I tend to the rose bushes in my garden. The hard work of pruning is finished, but I am far from done with my work. To receive gifts of magnificent blooms, such as the heavenly one in the photo taken last year, the bushes need a little more TLC. What living thing on this earth does not benefit from a little extra love? #1 – How do I love thee? Let me count the ways. Instead of buying Valentine’s Day cards at the grocery store, try doing this for each special person in your life. In your own imperfect handwriting, make a list of all the reasons you love him/her. At the top of your paper write Twenty Reasons Why I Love You and begin your list. Obviously 20 is just a number used as an example. Don’t stop at 20 if you have more reasons why you love this person. Think about what this person does that makes you smile or laugh. Consider the ways this person allows you to be yourself. Write down how you feel when you are around this person. What does this person bring to your life? You get my drift. What better Valentine’s Day gift than telling your special people what is truly in your heart! Recipe: Mix sparkling cider with pineapple and cranberry juice. Top with whipped cream. Garnish: Add a small lime slice and a maraschino cherry on top. Want to get away to a romantic destination for Valentine’s Day, but can’t? Take a look at these photos of some of the most romantic travel destinations courtesy of the Global Grasshopper. Oia and Venice are as romantic in person as they seem in the photos. I’m sure, though, they would have been a whole lot more romantic for me and my husband, if we hadn’t taken our kids with us! Have a simply lovely weekend! “How hard can it be to make them?” I wondered to myself after discovering how much fizzy bath bombs cost at a major cosmetic store. Having been spoiled by my children, who know how calming a good soak can be for their mom, I’ve enjoyed a nice supply of fizzy bombs up until now. 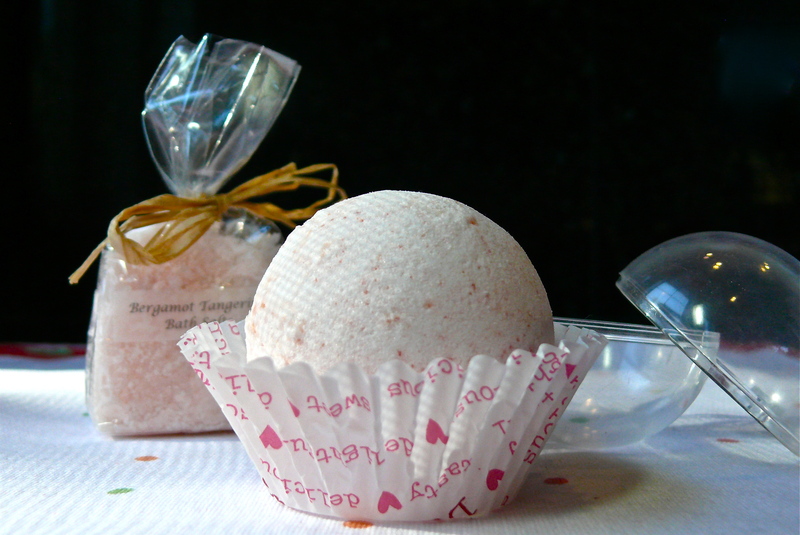 With Mother’s Day too many months away to receive my next gift of bombs and with my increasing need for “Calgon, take me away” moments, I went in search of those round, water-softening, delightfully aromatic bath bombs! As I stood in the middle of the store and looked at the different prices, I saw money going down the drain. At $4.00 to $7.00 dollars a bomb and at one bomb per bath, it’s a splurge for someone who likes to indulge in baths! At that moment, I decided to try making my own fizzy bath bombs. There are many sites on the internet that have step-by-step instructions for making bath bombs. I studied several of them, selected one, and went out and bought the necessary supplies. Because I make my own bath salts, I already had baking soda and essential oils on hand. Although it was an easy process and my first batch turned out reasonably well, I still want to experiment with different molds and ingredients and I’ll definitely try to perfect my technique. Bath bombs make great gifts. Just pop one into a clear cellophane bag and tie it up with a cute bit of ribbon. 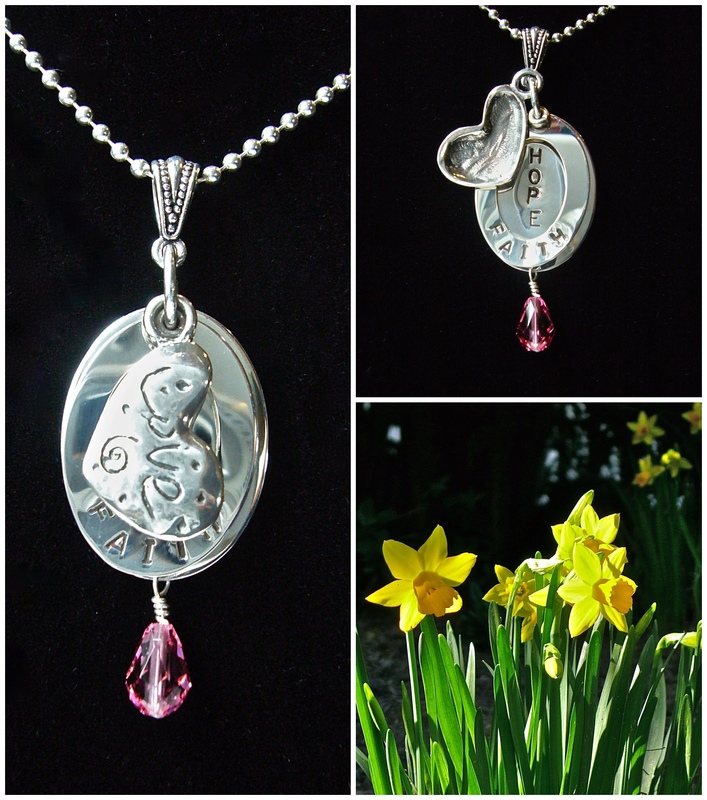 Think ahead to Valentine’s Day or Mother’s Day. You are only limited by your imagination! Egg-shaped ones would make cute Easter treats. Heart molds could be used for Valentine’s Day or bridal showers. And If secret messages are your thing, Martha Stewart has a page of Valentine-appropriate messages and labels available on her site. 1. Sift together the baking soda and citric acid in a large mixing bowl. (Make sure the bowl is completely dry before you begin.) Blend the mixture thoroughly, or the fizzy bomb will be too grainy. 2. Mix the sweet almond oil, essential oil and food coloring in a small bowl. 3. Stir the oil mixture into the larger bowl of baking powder and citric acid, and then mix it quickly with your fingertips. Speed is important, because if you mix too slowly, the mixture can begin to fizz. 4. Rub a bit of sweet almond oil on the inside of the molds, and then fill the molds with the mixture, packing them tightly with your fingers. 5. Let the fizzy bath bombs set for about 36 hours, then tap the molds lightly and gently remove the fizzy bath bombs. 6. Spritz the fizzy bath bombs with the witch hazel, which will help create a firmer outside cover. Allow the bombs to dry for 24 hours, turn over and spritz the other sides. 1. Essential oils can usually be purchased at natural food stores. 2. Citric acid is necessary to create the fizzing effect. It can be purchased at wine or beer brewing supply stores, select health food or natural food stores, or online. 3. I purchased plastic Christmas ornament ball molds at my local craft store. 4. Do not forget to oil the interior of the molds for easier release. 5. I wore disposable gloves, so that my hands would not become stained by the food coloring. 6. This recipe made two medium-sized (80mm) balls.